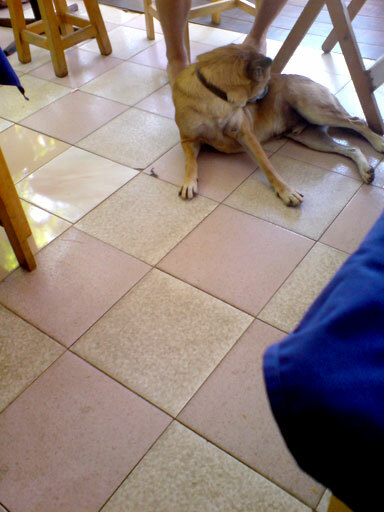 The dogs of Koh Samui, like helpless vagrants, all sleep outside during the day. Only at night do they come alive to wander the streets, possibly looking for food to fuel the next day’s siesta. In the human realm however, one senses a background anxiety. The feeling here is that everything is locked into the tour industry so tightly, that the only concern for the locals is to make enough money to make it into tomorrow, leaving little or no room to ponder greater concerns, such as how to ensure there will be enough water – destined, at this present rate of “development,” to run out in five to ten years. Just thirty years ago, no one needed to work to buy food. It was always available from the sea or the land. Now, the tourist industry and all that comes with it has blanketed the island and its people into a grid, dooming them to a kind of slavery regimented by the tourism machine into which they have been assimilated. The island, by all accounts, is only equipped to handle a tourist occupancy of 11,000 rooms. At present, investors and developers plan to double it. And without adequate enforcement of limitations on land development, the tourist industry is doomed anyway when the water supply is depleted. Perhaps only then, after total destruction, can the island be repaired and restored back to its original glory, and maybe this accounts for the sense of patient, quiet understanding among the Thais of Koh Samui. But then again, maybe it doesn’t.